To get the full info directly, we conducted an interview with a doctor. We managed to get an appointment with Dr Suntharalingam from the Pantai Medical Centre, Cheras, Kuala Lumpur. This is one of the nearest hospitals located near our school. Dr Suntharalingam is a Consultant Orthopaedic and Trauma Surgeon with more than 20 years of experience. We are very thankful to him for spending his time by giving us very valuable information. Let's view the interview and his demonstrations. Dr Suntharalingam also advised that we need to be extra careful if a child constantly complains about headache, shoulder pains, neck stiffness or neck pains and upper, lower or both upper and lower back pains. These could all be related to effects of carrying heavy loads on the back. He also cautioned that, even if children do not complain about back pain now, the effect could take place when they are about 40 to 50 years. To understand the effect better, we have animated the impact of heavy school bags on a child. Watch the animation below created by us to see the effects on the back bone. We noted that this problem existed in many parts of the world too. 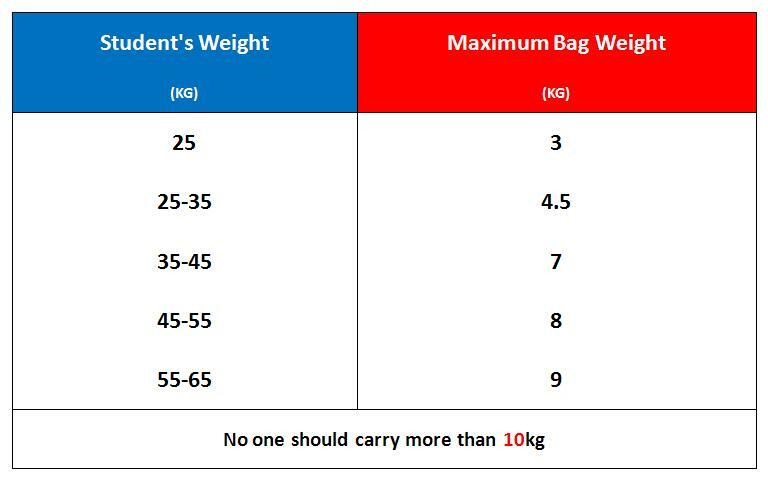 In the US, the limit of school bag weights as recommended by The Chiropactric Association in US is 10 - 20% of students body weight. According to various international reports and also feedbacks from doctors, currently there are much higher cases of kids having back related problems these days. We found various resources from the internet which highlighted the type of health hazards on students. · Use both shoulder straps so you distribute the weight evenly. Wearing your backpack on only one shoulder may cause you to lean to one side. · Stand up straight. If your backpack makes you hunch forward or lean to one side, you may be carrying too much weight or not using both shoulder straps. · Limit the weight. Carry as few books as possible. If you can leave a few books behind, do so. Doctors recommend carrying no more than 10% to 15% of your body weight. For example, if you weigh 80 pounds, your backpack shouldn't weigh more than 8 to 12 pounds. · Give your back a break. When you can, leave your backpack in your locker and carry just what you need. The British Columbia Chiropractic Association launched a campaign called "Pack It Right Pack It Light" in year 2009 to educate parents on the hazards of heavy school bags. The also mentioned "Just like kids, backpacks come in all types of sizes and fashions, but don't be fooled by the biggest and cheapest pack," said Dr. Don Nixdorf, Executive Director of the BC Chiropractic Association. "Function, form, and comfort take precedence over fashion." 1. Lifting heavy burden for a long time or distance is not good for children. Half of the school children develop pain in the back or shoulder. 2. Carrying a heavy bag on the back causes forward leaning and bad posture, which can lead to improper weight bearing on the spine, and pains and aches in the shoulder and back. 3. Carrying a backpack weighing > 15% of body weight makes a child or adolescent unable to maintain proper standing posture. Children could get into bad habits like poor posture and slouching. 4. Forward bending at the back (also called kyphotic posture) makes the work of breathing harder. Children carrying heavy bags have been found to have poor lung function. 5. Children who use one-strap bags (which put weight on one shoulder only) have a particular problem. These bags cause side ways deviation of the spine (scoliosis) because of the asymetric weight distribution and this can cause long lasting backaches and damage. Slinging the bag over one shoulder causes spine damage.